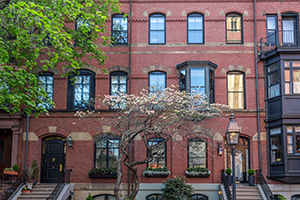 Beacon Hill is one of the most desirable neighborhoods in Boston, known for its narrow brick sidewalks; gas lit and cobbled streets, and beautiful old row houses with ornate ironwork. It is also the location of the Massachusetts State House, at the hill's peak – thus the state government being referred to as “Beacon Hill.” Only about a mile square and largely residential, this neighborhood also contains Suffolk University and the Massachusetts Supreme Judicial Court. Beacon Hill borders on the Boston Common and Public Garden in the south, and on the Charles River Esplanade to the west, both of which are valuable public green spaces enjoyed by residents and visitors alike. The neighborhood has some notable historical sites, including the Black Heritage Trail, which includes the Museum of African American History; the Boston Bar Association – the oldest in the country; and the Park Street Church, which was used to store gunpowder during the war of 1812, and was the first site where the song “America the Beautiful” was sung. Contact us to ask questions or schedule a tour, or scroll down to browse all real estate listings in Boston, MA. Register with us to save your favorite Boston real estate listings and get notified when similar properties become available. Classic Beacon Hill 2 bedroom 1 bathroom Top Floor Available July 1st. The unit features hardwood floors, high ceilings, open kitchen with/granite counters, excellent layout and many windows bringing in natural sunlight...Professionally managed building with common laundry in basement... Fantastic roof deck !! Listed by Delince P. Louis, Redfin Corp. Listed by Betsey Barrett, Brewster & Berkowitz R. E.